Australian social scientist Alex Carey wrote, “The twentieth century has been characterized by three developments of great political importance: the growth of democracy, the growth of corporate power, and the growth of corporate propaganda as a means of protecting corporate power against democracy.” The Madison-based newsletter PR Watch is dedicated to exposing that propaganda, and, along with its affiliated website, provides essential ammunition for peace and justice activists and others fighting corporate disinformation. The journal’s editors, Sheldon Rampton and John Stauber, have also put out a series of muckraking books that, thanks to meticulous research, careful sourcing and finely-tuned B.S. detectors, are among the best examples of modern-day muckraking. 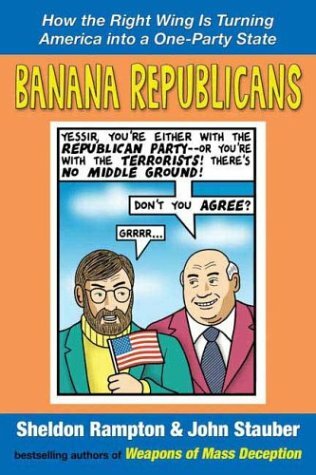 Their latest book, Banana Republicans: How the Right Wing is Turning America Into a One-Party State, follows on the heels of Weapons of Mass Deception, a thorough examination of the lies and disinformation used to sell the 2003 invasion of Iraq. The two complement each other, providing a motherlode of information about the machinations of the Bush Administration and the right wing movement that put W. into office. Of course, selling the sequel was an expensive undertaking. The Rendon Group, which created anti-Saddam propaganda for the CIA immediately after Gulf War I (during the first year of its contract the firm spent $23 million developing such material, including comic books and videotapes), made out especially well. Not the least of their accomplishments was creating the Iraqi National Congress (INC), helmed by embezzler and Pentagon favorite Ahmed Chalabi. Presto, Freedom Fighters! Paul Wolfowitz, Richard Perle, and other neoconservative hawks behind the Project for a New American Century(PNAC), which provided the blueprint for Bush’s post-Sept 11 foreign policy, were so enamored of Chalabi they dubbed him “the George Washington of Iraq.” But unlike Washington, Chalabi had no real following within his own country, a fact CIA higher-ups found disturbing but Bush’s inner circle didn’t. Given the predominance of oil industry veterans in the Administration, it’s not surprising that one of the INC’s key points of disagreement with its rivals was over how to disburse petroleum profits: though others supported nationalizing Iraq’s oil, the INC argued in favor of creating a private consortium (including ChevronTexaco, ExxonMobil and BP) to explore and extract those resources. Unfortunately for the Iraqi people, most U.S. voters do get their news from TV, and more from Fox news than any other source. A former Fox editor quoted in Banana Republicans lays down the basic journalistic standards of Murdoch’s network: “The facts of a story just didn’t matter at all. The idea was to get those viewers out of their seats, screaming at the TV, the politicians, the liberals—whoever—simply by running a provocative story.” Murdoch hired Roger Ailes, the veteran right wing media guru who helped Richard Nixon get elected in 1968, to run the fledgling news channel. Ben Terrall is a writer and activist living in San Francisco, CA. He co-edits the journal Indonesia Alert!. He can be reached at bterrall@igc.org.